I have to admit I am not the greatest fan of modern football arenas, while some have stunning architectural merit, Renzo Piano’s amazing San Nicola in Bari springs readily to mind, most are bland and featureless. 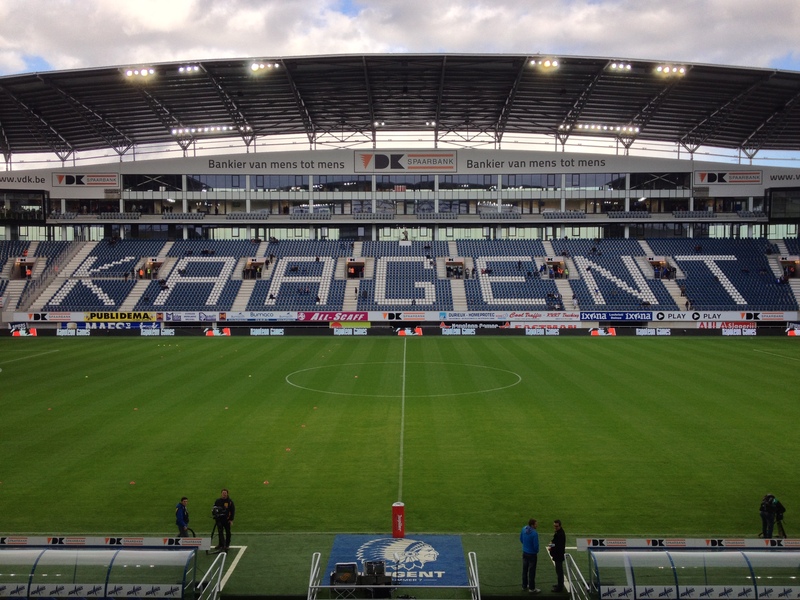 So when KAA Gent took it upon themselves to drag Belgium stadia design into the new millennia one couldn’t help but be intrigued by their new home at the Ghelamco Arena. 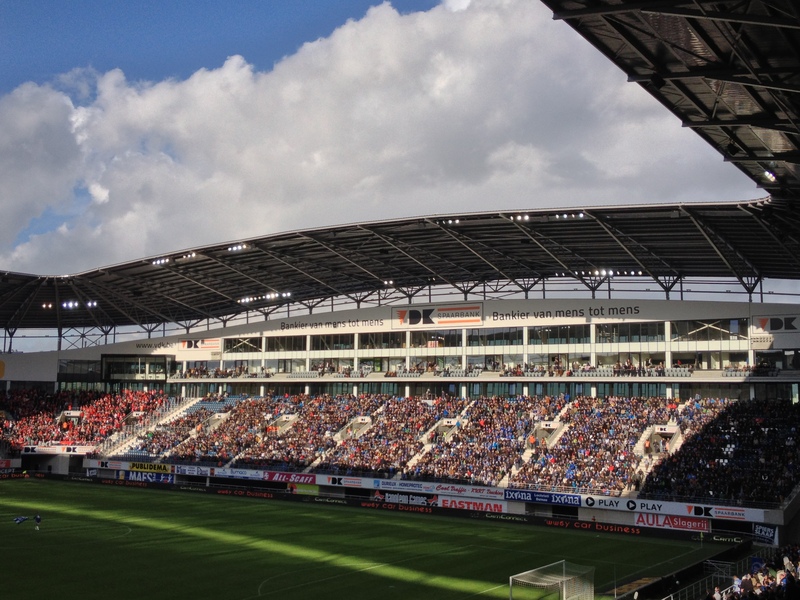 The 20,000 seater stadium opened earlier this season, becoming Belgium’s first total new build stadium since the Jan Breydelstadion was inaugurated way back in 1975. Koninklijke Atletiek Associatie Gent (also often referred to as La Gantoise) are one of Belgium’s oldest clubs. Its veteran matricule number of 7 dates back to formation in 1864. The association also has a track and field team and a hockey side, although the football club came somewhat later in 1900. The club adopted the Flemish version of their name in 1971. The club have the unusual nickname of the Buffalos which derives from an early twentieth century visit to the city of Wild West showman William “Buffalo Bill” Cody. The club has never won the Belgian title, being runners up on two occasions, the most recent being in 2009/10. The Buffalos have spent some periods in the second tier but their current spell in the Pro League has remained unbroken since 1989/90. Indeed in 1991/92 Gent enjoyed their best ever European run, reaching the quarter final of the UEFA Cup before falling to Ajax. Until this season Gent had played at the Jules Ottenstadion in Gentbrugge since 1920. It was built in time for the Summer Olympics of 1920 and hosted the Italy v Egypt match. The old stadium has now been demolished and will be redeveloped for housing. Gent first mooted a plan for a new stadium some ten years ago with it initially being ready for the 2007/08 season. However, a number of delays put the plans substantially in arrears. Finally the new arena was ready for occupancy for the start of this current season. Initially the new venue was called the Arteveldestadion before naming rights were sold to the constructor Ghelamco. It took some four years to get the venue into usable state, I won’t say complete as there is still work ongoing on a number of internal fixtures and fittings. 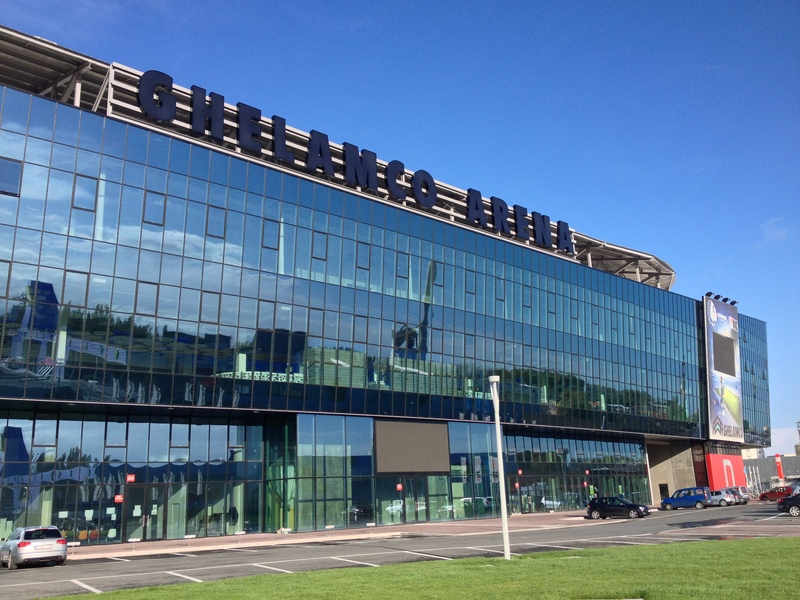 The stadium is handily located just off the E40 and E17 highways and is the first environmentally built stadium in BeNeLux. Most noticable is the floodlighting arrangement, drenchlights being integrally fitted underneath the roof to reduce light pollution. The exterior wall has a second layer to conserve energy, the roof is fitted with photovoltaic panelling to harvest energy whilst rain water is captured for use in the pitch irrigation system. All very impressive but what is it actually like for the spectator? Its a clean and shiny, and dare I say sterile, as you would expect from a modern day arena, however, there are some notable pluses. The leg room is substantial and the seats themselves are comfortable with some “give” in them. The sightlines all around the stadium are first class which goes some way to negating the wide access channel between the pitch and the stands. 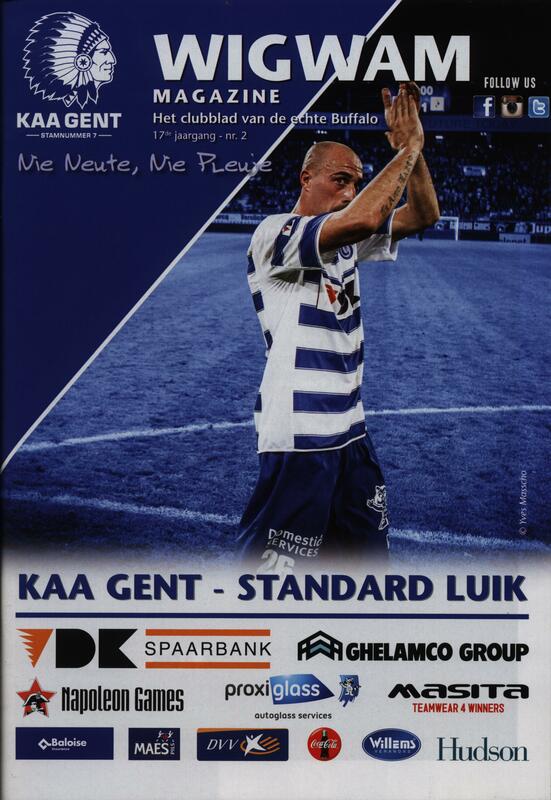 Today’s game is a big one for Gent who have not won a League game since August. Their Wallonian guests Standard Liège top the table despite a few recent hiccups. The home side huff and puff but ultimately fail to score a goal, the game being won by a wonderful strike from the ever impressive youngster Michy Batshuayi. Standard can even afford the profligacy of a 28th minute penalty miss, Mpoku hitting the post having snatched the ball out of Batshuayi’s hands in order to take the kick. It is the third time I have seen Standard this season and not only have they won all three, Batshuayi has scored five times. He really is one to watch in the very near future. In truth you do have to admire the Buffalos bold stance in moving Belgium stadiums into a new era, I for one hope the move pays off for them. 33. Sergio Padt; 4. Valery Nahayo; 19. Rafinha; 21. Nana Asare; 26. Christophe Lepoint; 10. Renato Neto; 24. Yaya Soumahoro; 39. Sloan Privat; 28. Nicklas Pedersen; 7. Yassine El Ghanassy; 9. Brecht Dejaegere. Subs: 1. Franck Boeckx; 11. Hervé Kage (for 24,63 mins); 12. Jan Vandeputte; 16. Rodgers Kola (for 39,63 mins); 17. Hannes Van Der Bruggen (for 9,71 mins); 23. Ervin Zukanović; 31. Remi Mareval. 30. Yohann Thuram; 23. Mehdi Carcela-Gonzalez; 4. Daniel Opare; 36. Dino Arslanagic; 21. William Vainqueur; 17. Yoni Buyeus; 25. Antonio Kanu; 40. Paul Mpoku; 39. Imoh Ezekiel; 23. Michy Batshuayi. Subs: 6. Laurent Ciman; 7. Reza Ghoochannejhad; 8. Ronnie Stam (for 23,86 mins); 11. Frédéric Bulot (for 33,61 mins); 15. Julien De Sart; 16. Anthony Moris; 75. Alpaslan Ozturk (for 4,83 mins). Yellow Cards: Nahayo, Neto (Gent); Arslangic, Vanqueur, Batshuayi, Ozturk (all Standard). 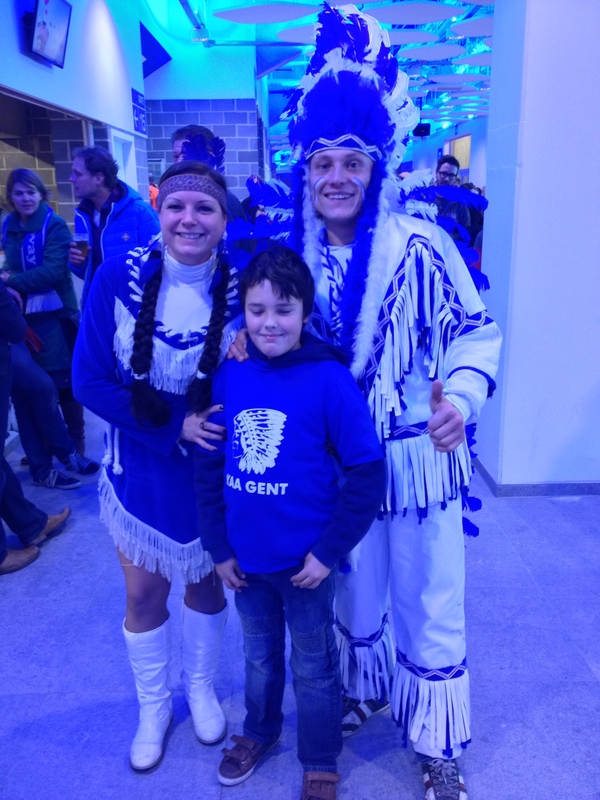 This entry was posted in Travel, Matches & Stadiums and tagged Batshuayi, Belgium, Gand, Gent, Ghelamco Arena, Ghent, groundhopping, Jupiler Pro Leage, KAA Gent, La Gantoise, Standard Liege, Standard Luik by peterrmiles. Bookmark the permalink. Reblogged this on No Standing.